Jujutsu is a traditional Japanese martial art and a technique to combat with enemies to defeat; the point is that the jujutsu follower did not use any weapon to confront the armed enemy. Jujutsu was also known as ju-jitsu or Japanese jiu-jitsu. The word «ju» can stand for «gentle or agile”, while the word “jutsu” means «art» or «technique». This technique was mainly used to manipulate the opponent rather than to confront. They used striking, throwing, restraining and weaponry techniques. According to the popular belief, the art of Jujutsu was originated during the epoch of war relations between the Japanese feudal clans of Minamoto and Taira during XI – XII centuries AD. The healer Akiyama Shirobei, a doctor from Nagasaki lived in China for many years where he studied the traditional Chinese medicine and the technique of using painful holds, striking and throwing that he systemized and called hakuda. When the healer returned back to Japan he opened his own dojo where he instructed in hakuda there. The process of hakuda study was too unvaried and monotonous that he lost all his followers and he had to close his school. One day Akiyama Shirobei was strolling along the garden in the cold winter enjoying the views of the environment when he noticed a wonder for him himself. He revealed that the older and more solid branches of trees would bend and break under the loads of snow whereas younger branches bended and straightened again throwing off the snowflakes. Such a phenomenon stroke his mind and the Japanese healer exclaimed “Flexibility is better than solidity to win!” This is what the principle of Jujutsu martial art is based upon when you pretend to yield to your opponent to defeat and win in the end! This is the philosophy of Jujutsu when the supple flexibility is dominating and winning. Later on Akiyama Shirobei introduced his newly developed Jujutsu martial art to the Imperial Court. He announced that he was capable to combat with any armed and non-armed opponent. That was very daring declaration from a non-young healer. However, there was no one at the Imperial court to defeat the Japanese healer. And thus, the Imperial Commission members came to the idea to use such martial art for future combating with real enemies. The austere and hard-headed samurai class warriors appreciated this combat technique and they quickly took the advantage of the martial art combating techniques to add to their battling experience. The techniques of Jujutsu were really too effective. According to the popular legends known from the Middle Ages, the samurais were too involved in the combatting that they would tear out pieces of flash with broken bones of enemies, insomuch they were involved and obsessed with combats. Before the epoch in XIV century the Jujutsu martial art was improved and developed only among the clan system not-affordable to others. In XIV century during suppression of the peasant suppression farm uprising on Okinawa the samurai warriors faced the effective shocking technique of combat trained out of traditional schools. Many centuries later the technique was known to everyone as karate-do. The school was getting more popular on the Okinawa as the protest to prohibition to carry the weapon among the islanders. 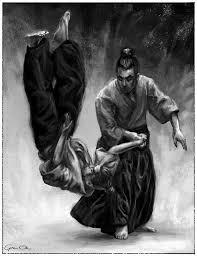 Nevertheless, the samurais quickly and effectively enriched the Jujutsu technique with more improved counter-holds against the striking school and they, thus, managed to resourcefully confront the street school of martial art. This was the new twist in Jujutsu development when the combat technique was successfully integrated with the striking one. Unlike the karate, wushu, muay thai, the Jujutsu has always been out of public access. It was predominantly developed between the samurai class warriors and on the top of it, every single class committed to develop and improve the martial art by the particular tendency typical for this or that clan. Today the Jujutsu martial art is like the close-in combat that makes approximately 60% of throwing and 40% of striking techniques. There are perhaps few schools of martial arts to boast in democratic character of techniques and training like the system of Jujutsu introduced nowadays. Any school of the system is competent enough to introduce their own individual school of training and thus, this system of personal combat is still effectively and creatively developed in Japan and outside it.